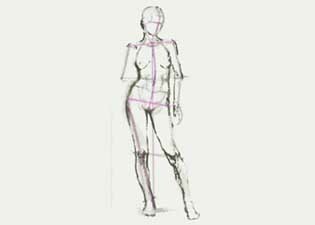 This lesson shows how to draw a standing female figure. Drawing the human figure requires knowledge of human anatomy and a lot of practice. If you have serious intentions, get a good book on anatomy, it is an important reference both for a novice and experienced artists. We strongly recommend to start drawing simple poses and preferably from a live model. Drawing the figure from unusual angles requires a lot of experience. Don’t draw the figure from a photograph. Being able to draw from a photo also requires a lot of experience, it often traps the novice artist in a superficial and bland type of drawing. Draw the figure slowly. Usually it should take at least three hours. Pay close attention to proportions, construction and anatomy. Always start from the important parts and move to the details. The size of the drawing should be A3 or larger. Draw the figure in simple poses from different angles. Study and copy drawings of Old Masters. What you see on the video is the basic steps. Start drawing the figure from the construction lines. 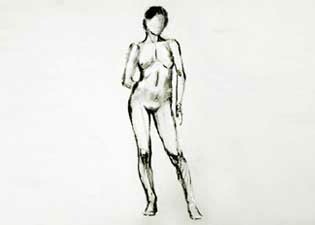 The sketch of a standing figure from the video. 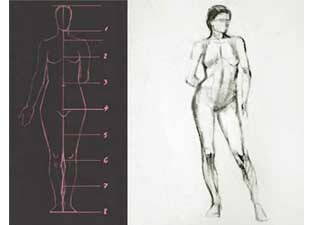 Proportions of a female figure.